THE JAMAICA FOOTBALL Federation has announced the itinerary for the forthcoming CONCACAF football championship scheduled to be played in Jamaica next month. Vere Technical and the winner of Globe United-MoBay Boys' Club match at 8.30. Wednesday Jan. 11 8.00 p.m.: Jamaica vs Netherlands Antilles. Thursday Jan. 12 8.00 p.m.: Cuba vs Haiti. Friday Jan. 13 8.00 p.m.: Trinidad vs Netherlands Antilles. Saturday Jan. 14 8.30 p.m.: Jamaica vs Cuba. Monday Jan. 16 8.00 p.m.: Haiti vs Trinidad. Tuesday Jan. 17 8.00 p.m.: Netherlands Antilles vs Cuba. 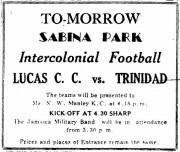 Wednesday Jan. 18 8.00 p.m.: Jamaica vs Trinidad. Thursday Jan. 19 8.00 p.m.: Haiti vs Netherlands Antilles. Friday Jan. 20 8.00 p.m.: Trinidad vs Cuba. Saturday Jan. 21 8.30 p.m.: Jamaica vs Haiti. Monday Jan. 23 Reserved for play-off if necessary.